How do I align timing dots with broken cam chain? Hello all, first post here, looking for some help. I have a 75 XS500, which I got with a stuck motor. Tried everything I could to free it with no luck, so I had to pull the head. Once I did, it took very little work to free up, and I am now in the process of putting it back together. My question is, due to the fact that I could not rotate the engine to align the dots before I broke the chain, how do I do it after-the-fact? 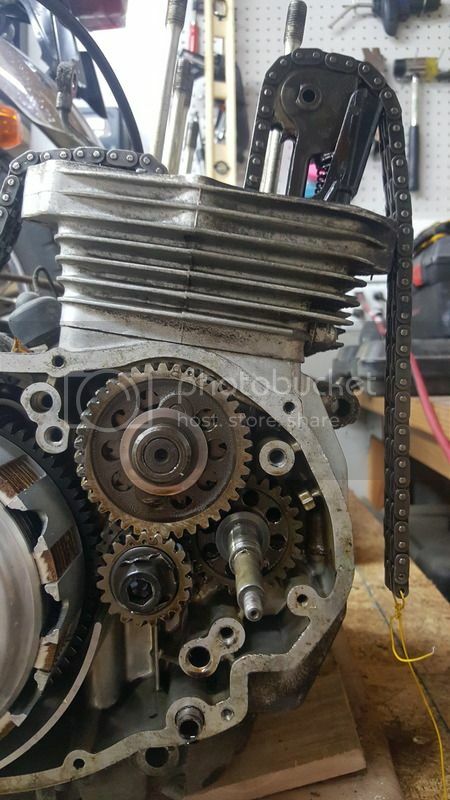 Re: How do I align timing dots with broken cam chain? Ridered0331, here are a couple of screenshots from the TX manual. This should point you in the right direction. So if I understand correctly, I should first reinstall the head, then align all my timing marks? My only concern is that the marks will all line up in a spot where I cannot install the new cam chain link. 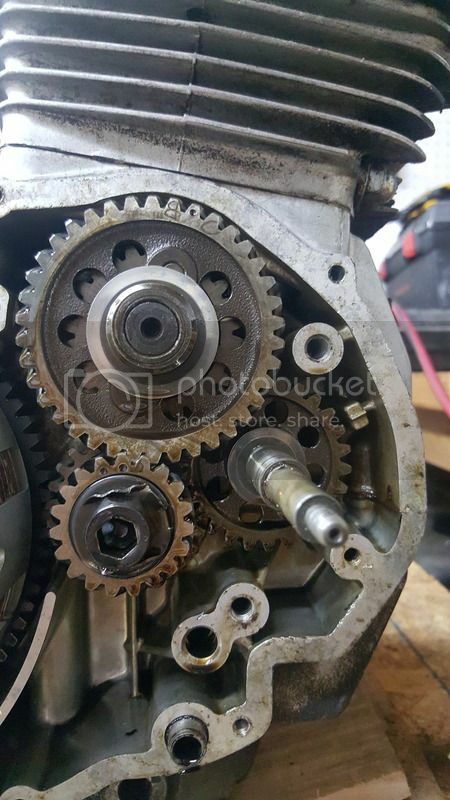 I was wondering if I could get enough slack on the bottom sprocket to rotate the engine without moving the cam chain? 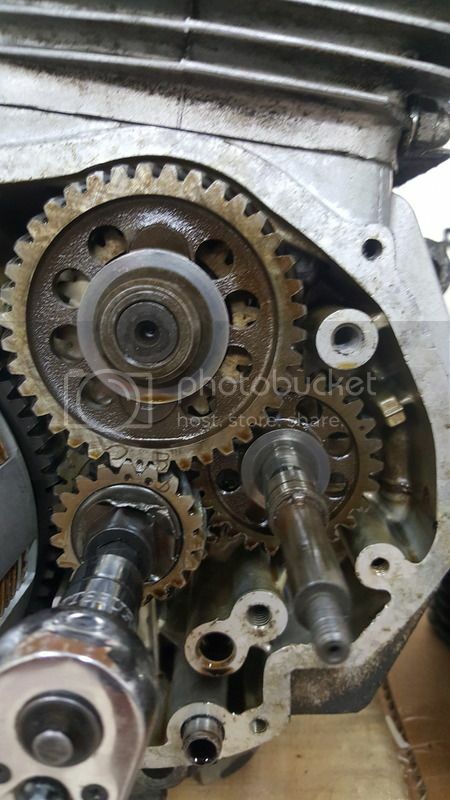 If you are ready to zip-up the engine and you did not disassemble anything below the jugs, you should be able to rotate the sprockets to obtain alignment bringing the chain into close proximity to receive the link. You can then install the head and cams as per the manual. Judging by the picture, you don't have far to go with the rotation. Possibly 1 rotation of the small sprocket clockwise. If you don't have a manual for your XS, you can find one online for the TX (85% the same engine) as you will also need alignment of cams info. and torque specs. etcetera. There is also a lot of info regarding this issue, just use the search feature in the forum. I got everything lined up without issue, you were correct that I was only about half a turn out. My concern is the chain seems to be out-of-center for when I go to install the new chain link. Based on this picture, in your opinion, do you think I'll be able to properly install the new link? So I took a leap of faith and moved forward. Everything seems to be on properly, but my new problem is that my cam chain is about 1/8" too short to attach to the other side. The use of a chain puller will help but not necessary. What I've done before is wire the chain together and rotate the sprockets until the chain ends are centred over the chain guide. There is a chance that the chain is riding up on the tensioner sprocket and this would help re-position the ends better to receive the chain link. Worth a try! So I'm still having no luck with connecting this chain! In order to get slack on the bottom end of the chain, you have to remove the driven gear and contact breaker gear. this should allow you to re-position the chain. 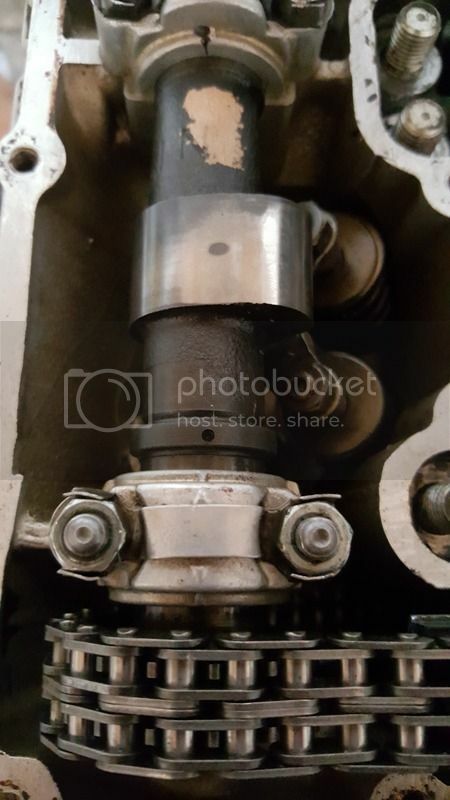 For what its worth, I would try taking out the camshafts, taking out the slide between the camshafts, temporarily joining the camchain, and locking the camchain tensioner out of the way with the acorn nut. 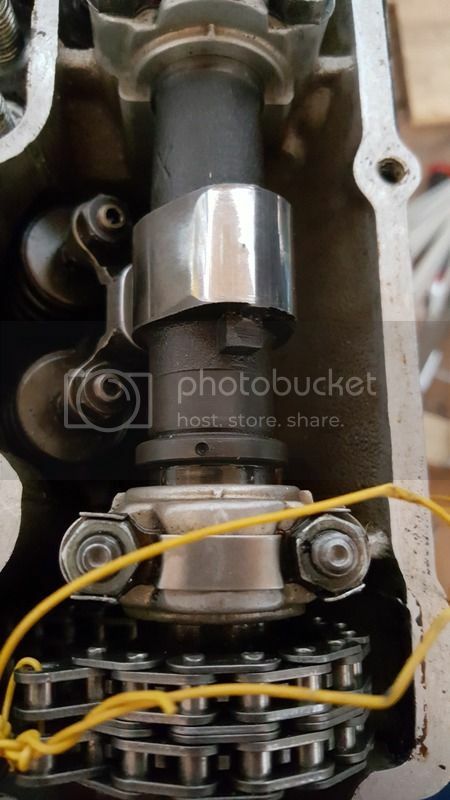 Then I would hold the chain up tight to make sure it is set right on the teeth at the bottom wheel, and at the same time "walking" the camshafts along the camchain and carefully snapping the camshafts into their holders one at a time. I think you can do one and the other until you get the marks lined up on top. Then add back the camshaft holders and slide the slide back etc. Then put the camchain link in. (I suggested temporarily joining the camchain in case this doesn't work for you). I was able to replace a broken intake camshaft this way without breaking the camchain, so it might work. 1) Make sure that you have the cam chain inserted correctly. 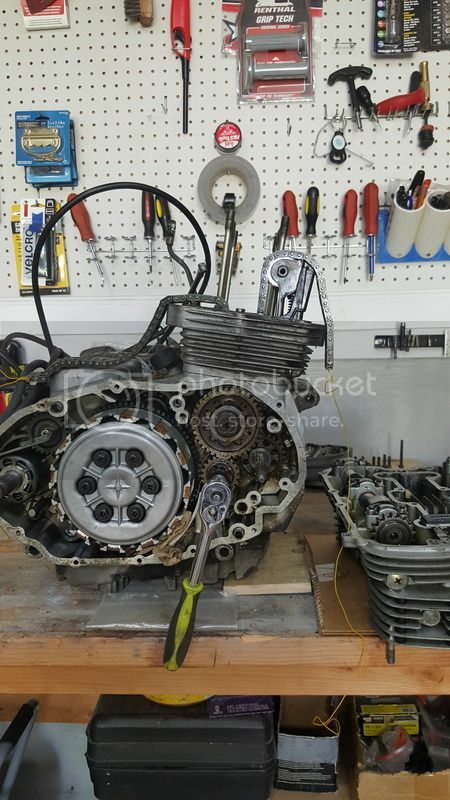 With the right side cover off the cam chain should be wrapped around the crankshaft (in a U shape) in such a manner that both chain ends are of equal lengths when suspended from above. 2) Thread left side of cam chain up through the head to top of left camshaft (looking at engine from side view). There is a free spinning cog on the left side. The chain must be to the RIGHT of the cog, not wrapped around the other way. 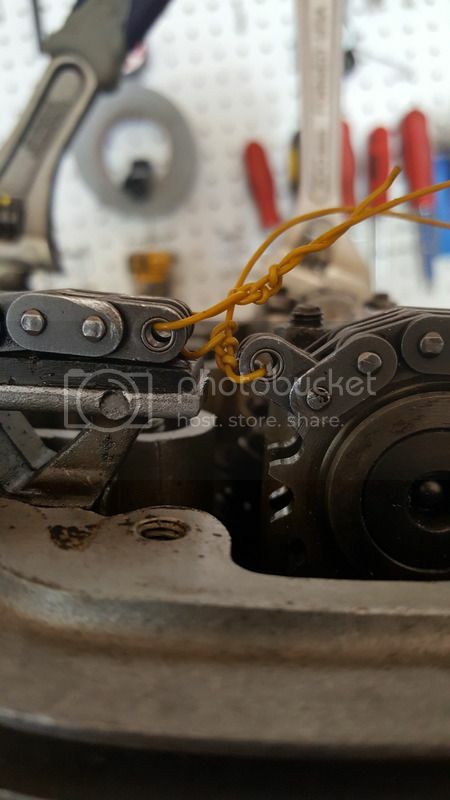 3) Thread the right side of the cam chain through the head and wrap around right camshaft as shown in your photos. 4) There will be ample space to connect the two links with a new spacer. Release tensioner when all buttoned up.